Fresh, organic, and healthy prepared meals delivered to your home. Starting at $9.33 per meal. Keep things super simple and order online from our prepared, healthy meal plans. Alternatively, you can customize your own plan from our A La Carte menu. Your heart-healthy meals are pre-made and delivered fresh straight to your home. Place the heat-proof containers in your fridge until you're ready to dine. We deliver nationwide. Heat up your meals in the microwave and you’re good to go in 3 minutes! Then spend the rest of your day quietly confident that you can nourish your body and enjoy your food too! Premium quality meals, with a delicious, nutritious twist. In the 21st century, we believe that supplying your body with everything it needs to truly thrive shouldn’t have to be a challenge. Thankfully, with Fresh n’ Lean, you can now have your kale and eat it too. Your scrumptious, healthy meals are prepared fresh and delivered right to your door, so you can have high-quality fuel on tap whenever you need. Put your meal prep on autopilot. Save time on grocery shopping, cooking, and cleaning. With our healthy meal delivery service, you’ll get organic, chef-prepared meals delivered to your door every week. Our recipes are dietitian-approved so you get all the essential nutrition your body needs to stay active and productive. Work deadlines, family commitments, exercise, social gatherings. Amongst the busyness of everyday life, healthy eating often goes out the window. Shopping for groceries and cooking up fresh food takes precious time and energy that most of us simply don’t have. With our prepared healthy meal delivery, we put in the hard work for you, so there’s one less thing on your to-do list. Everything we create is made from locally-grown, organic, wholesome ingredients – low in calories, fat, and sugar, but jam-packed with lean protein, fiber, vitamins, and minerals. Always fresh and never frozen, everything is made completely from scratch and approved by dietitians to help support a healthy, active lifestyle. Healthy eating doesn’t have to be boring! Our professional chefs craft wholesome, mouth-watering masterpieces inspired by cuisines from across the globe. Everything is free from artificial ingredients and processed sugars, but still brimming with bold, natural flavors and all the antioxidants and phytonutrients you could ask for. Win-win! Nourishing your body has never been easier. Order online and your organic recipes are packaged into insulated boxes and shipped directly to your home or office once a week. All you have to do is heat them up when you’re ready and enjoy flavorful, nutritionally-balanced brain-fuel whenever you need! You’ll receive a selection of delicious, prepackaged meals – ready to heat and eat. All packed with colorful, whole ingredients, rich in vitamins, minerals + antioxidants. You can select custom meal plans that fit your dietary needs and preferences. Enjoy easy, free nationwide food delivery to your home or office with each order. Why Healthy Food Delivery Plans? Going beyond the ‘diet’ to truly thrive! There are many components to living a healthy lifestyle, but the food on our plate is a great place to start. For various reasons, that task is often easier said than done! We want to make it easier than ever for you to enjoy nutritionally balanced meals that taste just as awesome as they make you feel. Grocery shopping, weighing ingredients, calculating macros… Healthy eating can often feel like a constant chore when you’re flying solo. The great news? With Fresh n’ Lean, you can sit back, turn down the stress meter, stock your fridge full of goodness and dig into a quick feast whenever you please. Instead of cutting calories and restricting your portion sizes, we focus on filling our balanced meals with nutrient-dense foods. Organic fruits, vegetables, lean protein, and whole grains keep you fuller for longer and help stomp out pesky cravings whilst satisfying your taste buds – the perfect recipe for enjoying healthy weight loss and overall wellbeing. We’re not about the quick fix or fad diets. Instead, we see nutrition as a part of the bigger picture. Our healthy meal plan delivery is designed to be sustainable in the long run, providing your body with everything it needs without restricting calories or eliminating whole food groups. It’s not a diet, but a lifestyle change and we’re here to support you all the way! When you’re shopping for exotic superfoods and trying to go organic, the cost can quickly add up. The great news is that living a healthy lifestyle and eating a nutritious diet no longer has to break the bank. Our healthy prepared meal plan works out at just $9.33 per meal, including free delivery. Balanced, healthy meals delivered since 2010! Our goal is to make healthy eating a breeze. To do that, we source locally-grown organic produce and plant-based ingredients, and our professional chefs transform them into culinary masterpieces. The result? You get incredible, heart-healthy meals delivered to your door once a week. Easy-peasy! You can sleep easy knowing that all meals included in our affordable healthy meal plans are packed with lean-protein, omega-3s, and nutrient-dense whole foods. All free from gluten, dairy, artificial flavors, MSG, preservatives, and processed ingredients. Everything you need to thrive, and nothing more! Ready meals sure are convenient, but store-bought varieties are all too often drowned in unhealthy oils or artificial preservatives. That stops now! Our pre-made meals are cooked from scratch with whole foods, delivered completely fresh (never frozen) and designed to be ready in just minutes. Perfect at home or on the go! Whether you’re a health-conscious individual looking to enhance your healthspan, someone with a health condition trying to control your blood sugar, or an active individual attempting to improve recovery and increase performance, our healthy diet plans can fit in with your goals and dietary requirements. Paleo, Whole30, plant-based, gluten-free – no problem! Our chefs thrive off creating innovative dishes packed with natural flavor and brimming with goodness. No added sugar or artificial ingredients in sight — we let the natural flavors of our fresh veggies, zingy herbs, and natural spices do the talking. Fresh n’ Lean is one of the largest healthy meal prep delivery companies. Breakfast, lunch, and dinner – everything we cook for our customers is dietitian-approved and prepared from scratch using all-natural, organic ingredients, then delivered right to your door. Have a question about our food delivery service? What makes your meals so healthy? We’re more than just a low fat, low sugar, low sodium meal prep service. Everything we make contains natural, organic, whole foods. In any recipes that contain animal protein, we source grass-fed meats and wild caught fish – always organic and antibiotic free. You’ll also find plenty of fiber-rich whole grains and legumes, a wide variety of fresh vegetables, and healthy fat sources. Everything is nutritionally balanced and approved by our dietitians. Will I get bored with the meals? Are the meals flavorful? We guarantee you’ll never get bored with our meal prep service. Each of our prepackaged meals is crafted by professional chefs with a passion for flavor. They use a wide variety of delicious ingredients inspired by worldwide cuisines. Our menus change every week, so there’s always an exciting new taste just around the corner! What should I eat in between meals? Do you have snacks? 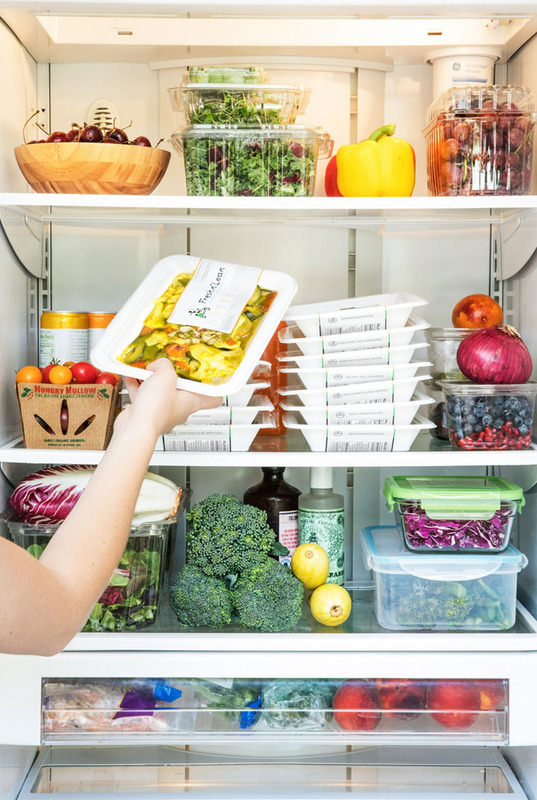 Our home delivered, heart-healthy meals are designed to be nutritious and filling, so you may actually find that you no longer crave any food in between your main dishes! However, if you still feel the need for a snack here and there, you can either opt for your own or choose from our healthy snacks on the A La Carte menu. We offer almonds, granola, sesame chips, and much more! Do you offer healthy desserts? Our focus is to supply you with three healthy meals delivered to your door each day, so our dessert menu is currently limited. However, we do offer delicious almond butter cups for your sweet tooth, and we’re told that our popular muffins and cinnamon maple almond snacks can also work perfectly as a dessert.